In this episode I talk about the 5 most popular reasons for not wanting to cross stitch and solutions to help you over come them. I hear you! Sometimes it’s easy to spend our money on the essentials (food, rent, clothes for the kids but not yourself) and less so to spend it on a treat for yourself. I’m not going to go into why my cross stitch kits are the prices that they are, and I’m also not going to tell you how much you need a cross stitch kit in your life. I know they’re not an essential (unless you’re a cross stitch fanatic like me) but you can read all about the benefits of cross stitch if you would like to know more about them. Instead, I’m going to try and help you afford it. I (as well as other cross stitch kit sellers) have various selling platforms; my website, Not On The High Street (NOTHS), Etsy and Folksy. Have a look around and see if there are any sales on these platforms; not everyone runs sales on every platform. For example, my sales are usually just on my website or Etsy. And of course there are high street shops that sell cross stitch kits, as well as Cloud Craft and Sew and So (two of my favourites). These shops and retailers run their own sales throughout the year. Keep your eye on social media to see if there are any discounts especially around particular occasions sure as Black Friday, Bank Holidays etc. Joining my Facebook Group is the best place to hear about any specials I’m running and I hold regular giveaways in here too! You could ask for a kit as a present. Maybe you have a birthday or anniversary coming up or Valentine’s/Christmas/Mother’s Day etc. And if you can buy the kit on Amazon, pop it on your wish list. Cross Stitch Magazines usually come with a free cross stitch gift and tend to cost around £5, and they are full of extra patterns too. Or if you are conscious of the paper use, digital subscriptions to some cross stitch magazines can cost as little as £35 a year and then you have access to all of the patterns on your phone, helping the planet, saving you money and saving you space! You could also buy the pattern through Etsy etc and buy your own supplies from a local craft shop. Sometimes this can work out cheaper than buying the full kit and saves on the cost of postage and packaging. My most used phrase; “I don’t have time”. Yet I still somehow manage to whip up around 20-30 hoops a year. As a busy, working mum of two I totally know that lack of time is a real problem. I could go off on a tangent about how we should all create “me time” but I know that isn’t always practical (and I did this on last months episode a little bit). The reason I create the kits you see in my shop is that they are small, easy and fun. They are hoops you can pick up and put down throughout the day so you don’t have to concentrate too hard on them. They are easy to transport so you can take them on the commute to work with you or on holiday. They won’t take too long to finish, so you get the satisfaction of creating something totally by hand even with little time to work on it. 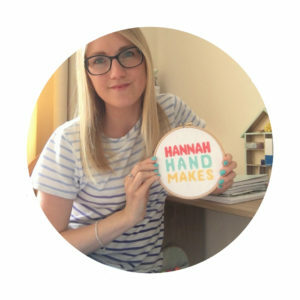 Head over to this podcast episode if you would like more tips on finding the time to cross stitch or shop our smaller kits. Although I always say “cross stitch is easy”, when you are a complete beginner of course it isn’t actually that easy. It can seem quite daunting! Especially if you have no experience of sewing at all. If this is you, then I will say that cross stitch is one of the easiest crafts to learn. Once you get the hang of the basic “X” cross stitch you can make such beautiful pieces and you never need to learn another stitch if you don’t want to. My kits come with paper instructions but if you are still stuck then I break these instructions down further into short, individual videos you can keep referring back to. I also have a couple of podcast episodes with a small cross stitch glossary to help you get started with the basic terms of cross stitch. As someone who originally studied law this is something I completely understand. I never really believed I was that creative. I liked colouring in and writing, but I was never great at drawing from my own imagination and like most people I believed that drawing was the only way to be creative. However, I now know that creativity goes much deeper than being able to draw. Even if you use 90% of the left side of your brain, there is still 10% that craves something creative and cross stitch can definitely help with that. Once you have got the basics of threading your needle and making that “X” stitch, the only thing you need to do is count (pretty useful if you’re left side dominant). You can have no creative experience at all and still create a beautiful hand stitched piece using cross stitch. If you are not sure if you use the left or right side of your brain more, you can take this test. I am 49% right and 51% left and I run a creative business, proving you don’t have to be super creative to do cross stitch and that it’s OK if you like both cross stitch and more logical things. For example, I love doing accounts as much as I love doing cross stitch. I believe we need to stop putting ourselves in boxes, put down that label gun and start branching out to what our heart calls us to. I’m not going to tell you this won’t happen because it more than likely will. It happens to me a lot. This is why I love smaller projects because I can see the end and this keeps me motivated. But I have plenty of projects that I have started and not finished and one hoop took me about 3 years to finish. This goes for any project, not just cross stitch and my advice, if it happens, is not to fight it. Some people like to plough through even if they don’t feel like it, but I don’t think this is necessary if you are doing cross stitch as a hobby because you should be enjoying it! Instead, I would give into the lack of motivation and take a break from the project. When this happens to me I do something else and it’s not always something creative. If I’m just struggling to get going, I find cleaning helps clear my head so I will start scrubbing the bathrooms. If I feel like it’s going to be longer I will play a game on my phone and not feel guilty, or I will colour in or do some drawing. If I’m looking for something the total opposite though I will do some accounts for the business, but if you don’t run a business you could try some puzzles such as Sudoku. Doing a stitch-a-long is a good way to keep you motivated during stitching too. My newest SAL is my Hello Spring SAL, but keep an eye out in my Facebook group for any new ones coming up. And most importantly, remember this will pass and your creative juices will start flowing again! This months pattern is from Hello Hoop and is a lovely little design with a rabbit, the word “Spring” and a flower garland with little carrots in it. It costs just over £4 at the time of recording and if stitched on 14 count aida it measures 6.79 X 6.29 inches. Sign up to the cross stitch podcast newsletter and get free cross stitch project planner sheets.